The adrenal glands are part of the endocrine system in which they secrete hormones that mediate various factors to put the body in its equilibrium; The adrenal glands secrete aldosterone, cortisol, and androgens from the cortex; it secretes dopamine, epinephrine, and norepinephrine from the medulla. There are pathologies associated with it in which less hormone are produced or hormones are overproduced which destroys the equilibrium of the body. Keep in mind that the adrenal glands are composed of two different embryological layers. The adrenal cortex is from the mesoderm layer and the adrenal medulla is from neural crest cells of the ectoderm layer. The cortex has three layers, as it’s pictured in the First Aid book. A pathology in each layer can cause various problems which is discussed further in the chapter in details. The first layer produces aldosterone for sodium retention, hence water retention. When the body’s blood pressure is low, the kidney’s juxtaglomerula cells produces renin. Renin then converts angiotensinogen, from the liver, to angiotensin I. Then ACE (angiotensin converting enzyme), from the lungs, converts angiotensin I to angiotensin II. Angiotensin II then stimulates aldosterone synthase enzyme, in the zona glomerulosa, to convert corticosterone to aldosterone. The second layer produces cortisol for maintaining blood pressure with epinephrine via permissive effect. Cortisol is important in inducing gluconeogenesis (proteolysis and lipolysis) in periods when glycogen stores are depleted. Chronic stress induces prolonged release of cortisol. The third layer produces androgens, the precursor for testosterone, dihydrotestosterone, and estrogen. The inner layer of the adrenal gland is composed of chromaffin cells. The medulla produced catecholamines (dopamine, epinephrine, and norpeinephrine). A pathology of the adrenal medulla in adults is pheochromocytoma and in children it’s called neuroblastoma. Since the adrenal medulla is from the neural crest cells, a biopsy of the chromaffin cells will be be S-100 positive. I labeled the important structures in the figure below to be familiar with where the adrenal gland lies. The adrenal gland is also called the suprarenal gland because it’s above the kidneys. The adrenal glands drain differently from each side. 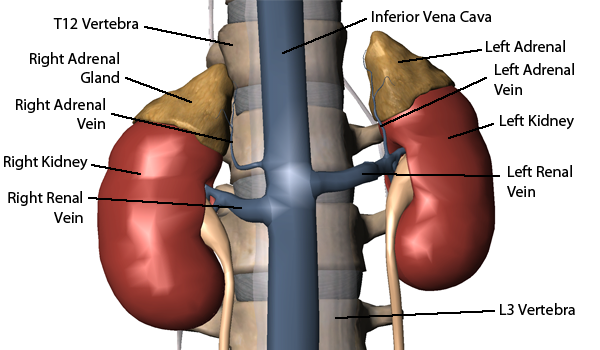 The drainage path of the left adrenal gland is longer than the right because the left adrenal gland drains first to the left renal vein via the left adrenal vein to the inferior vena cava. And the right adrenal gland drains directly to the inferior vena cava via the right adrenal vein. NOTE: The gonads drain in the same manner as the adrenal glands. The left ovary/testis first drain to the left renal vein via the left ovary/testis vein, then they drain to the inferior vena cava. And the right ovary/testis drain directly to the inferior vena cava via the right ovary/testis vein.